Hi cuties! If you follow me on social you know that my days can be quite literally batsh*t crazy. I mean there are days when I leave my house at 6:30 am and don’t come home until 9:00 p.m. From shooting, to work, events, hanging with friends - it’s all jammed packed into my hectic life. Because of this, I’d say I have gotten pretty good at taking any outfit from work to play with just a few tweaks and one essential: sneakers! Today I’m walking you guys through some of my tips in partnership with SOREL. I’m pretty lucky to work in a creative environment where sneakers are not frowned upon because y’all, they are my life! I am that girl that shows up in sneakers everywhere I go - yes, even on a night out, no shame. They’re just so practical! And if you find the right pair, super versatile as well. Cue: this trendy pair that I simply can’t get enough of. I was shooketh when I first saw these - I mean, what’s not to love! They’re fashion-forward, comfy and black so they go with just about everything. They’re the ultimate pair of sneakers to take from work to play in no time. Ok so let’s dive right in - here are my three tips to transition your lewk from day to night with some simple tweaks! 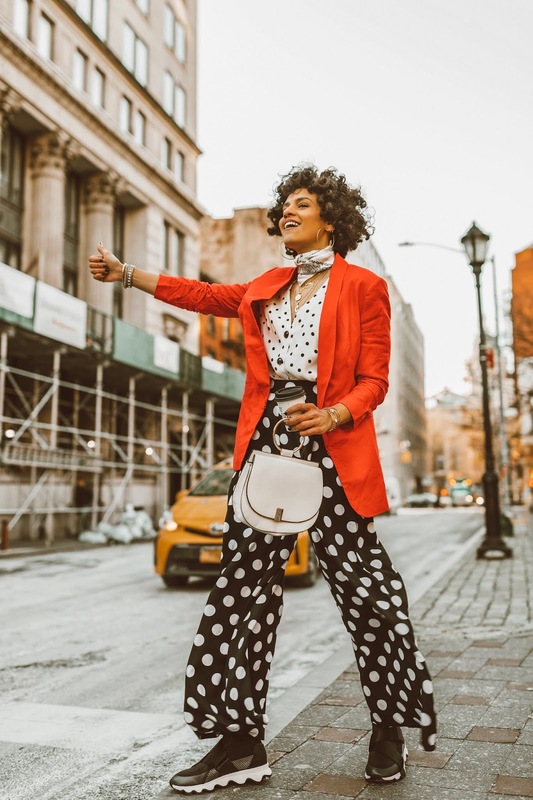 Pick your “keep” pieces first - for any commuters (like myself) who don’t want to pack a-whole-nother outfit to work, start with some pieces you know you can wear to work and to play. 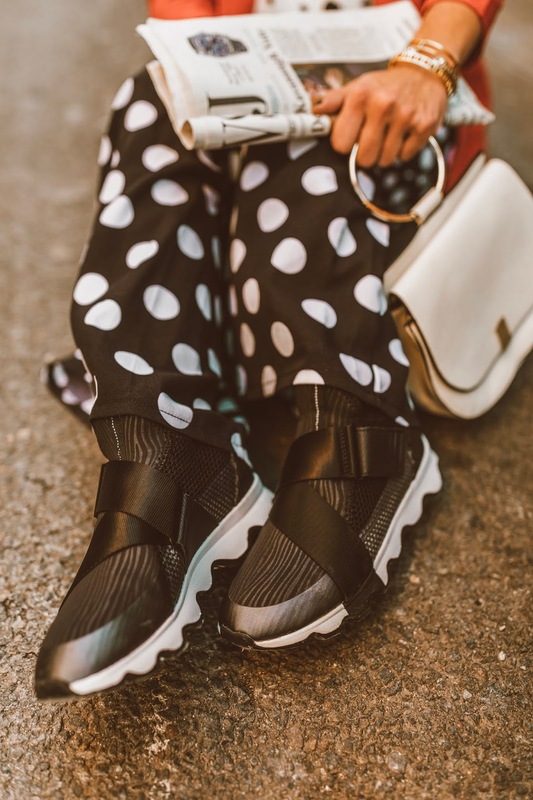 For me, this polka dot top and my SOREL kicks were it. I know these pieces will tie any outfit together while still fitting both scenarios. I personally feel more productive/more willing to go out at night when I feel comfortable, so sneakers are a must! I’d also pay attention to patterns - I know I picked a polka dot top here, but if you’re not much a mix-and-matcher, stick to staple pieces. 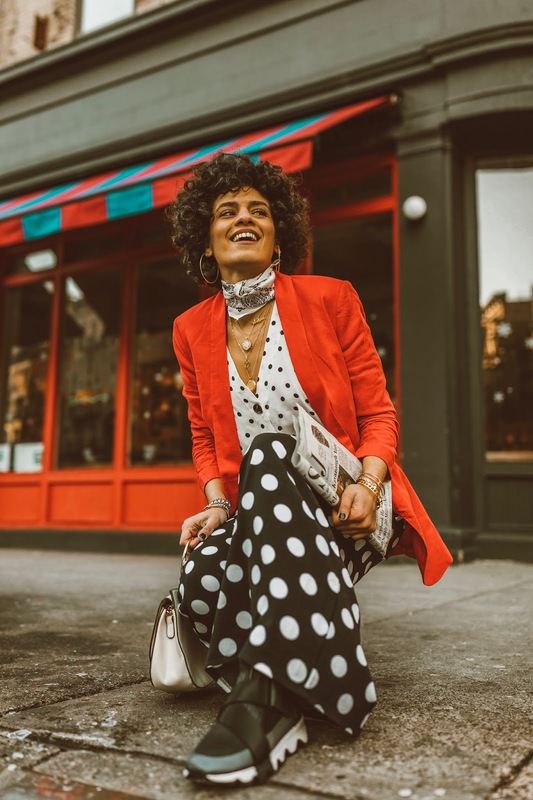 Accessorize like it’s your job - simple accessories, like a hat, a neck-tie or even statement earrings can quickly transform a look. Here I swapped my paisley scarf for a tartan-esque beret to give the outfit a more playful flare! Creatively layer - I love to think outside the box when it comes to pieces of clothing! 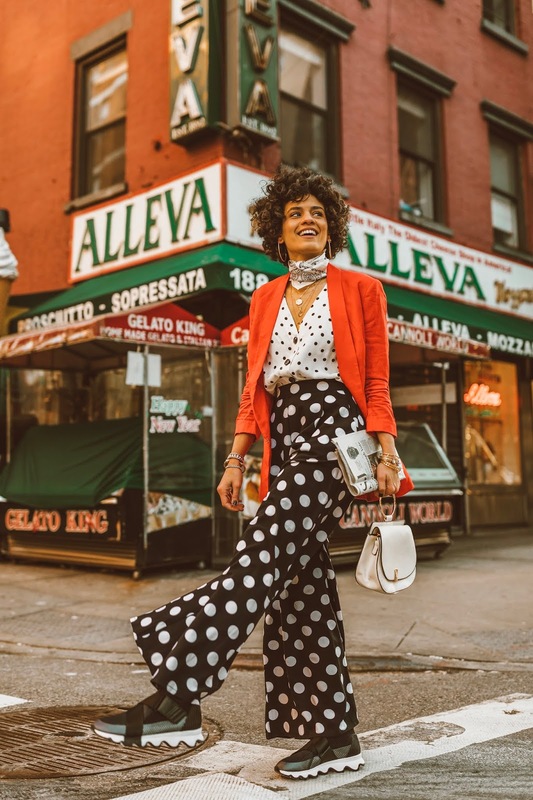 For example, in my “play” look, I threw on a turtle neck under the polka dot top which makes the overall outfit a bit more casual. Think: dresses under tees, scarfs as belts, camis over sweaters - go wild with your layering! This blog post is sponsored by SOREL. Thank you for supporting the brands that support CAOL!